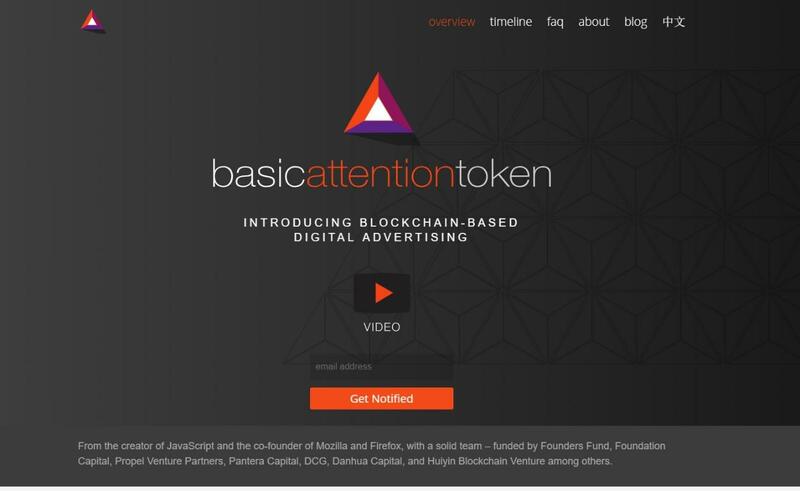 The Basic Attention Token (BAT) is a payment system that rewards publishers for their content and users for their attention, while at the same time giving advertisers with more in return for their ads. BAT seeks to become the new token for the digital advertising industry. With BAT, users will receive a faster and less cluttered users experience; publishers will increase their revenue share, and advertising will receive better reporting. Your browser knows almost everything you do, the sites you visit, the time you spend on them, what you look at, the searches you make, the tabs you had open while making a purchase, etc. The amount of data your browser collects about you is endless. But what if you could prevent this, while still having a great browsing experience, one that is faster and ad-free? Better yet, what if instead of being subject to content you don’t really want to see, you elected to share your data, and were given the ability to reward content creators with tokens for their great content, which would inspire them to continue to create awesome content? 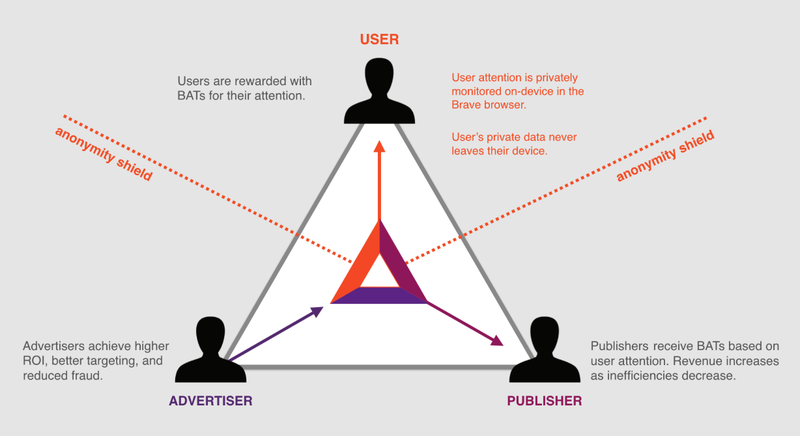 That’s the idea behind Basic Attention Tokens (BAT), the internal token of Brave, a fast, open source, privacy-focused browser that offers a reward system for users, awarding publishers based on the unit of user attention. BAT is seeking to be the token for a decentralized and transparent digital ad exchange based on blockchain. With BAT’s platform, you don’t have to worry about your personal data being stored or sold to third parties. No one can identify or track you from site to site without your knowledge, and you can change your security and privacy setting on a per-site or browser-wide basis. And it does all of this while also ensuring that your browsing experience stays safe, fast and private. On the publishing side, it is known that the publishing industry faces enormous challenges. In its pressure for optimized clicks, content quality has suffered, investigative journalism and foreign news bureaus have had their budgets cut drastically. This is all occurring while marketing budgets soar yet publisher revenues steadily decline. BAT’s new revenue-sharing system seeks to bring a solution to this much-discussed problem. Basic Attention Token has a number of strategic partners, including Uphold, a digital money platform, DuckDuckGo, an Internet Search Engine that emphasizes protecting searchers’ privacy, and Private Internet Access, a personal virtual private network service. In April it announced a partnership with the Dow Jones Media Group to deliver premium content to new audiences, while testing the use of blockchain technology in digital publishing. A month later, the company announced a partnership with Townsquare, a radio, digital media, entertainment and digital marketing solutions company. Together the two companies aim to help Townsquare re-engage ad-block users. In addition, BAT has verified publishers with the Brave Payments programs who receive monthly contributions in BAT from users. These include major publications such as The Guardian, The Washington Post, VICE, Vimeo, MarketWatch, Barron’s, and major YouTube and Twitch channels. 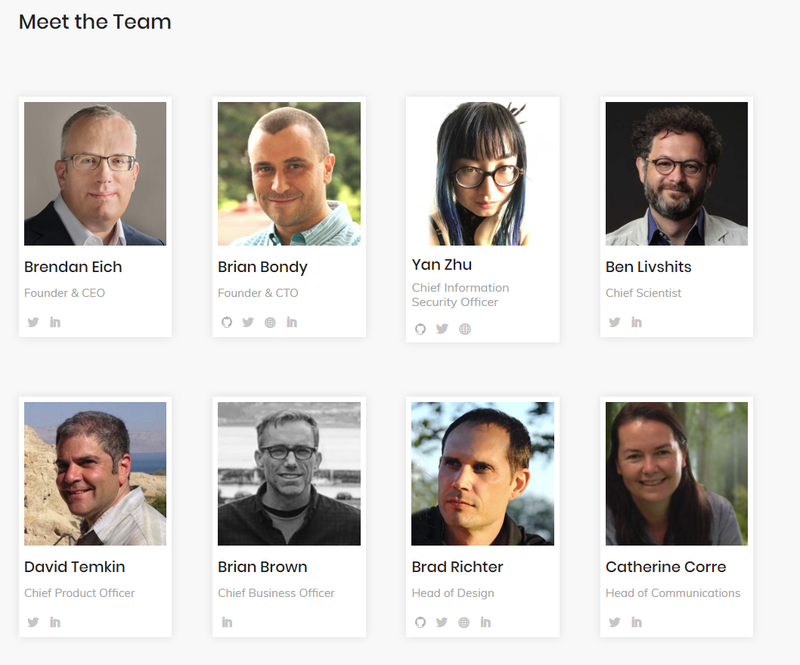 The BAT team is funded by prominent venture capital firms, including Founders Fund, Propel Venture Partners, Danhua Capital and Huiyin Blockchain ventures. BAT had an ICO that took place at the end of May, with its token selling for $0.04. The company is famous for raising $35 million in its ICO in just 30 seconds. In January the token peaked at $0.86. After news of its partnership with Dow Jones in April, the token price soared to $0.45. The token also rose after news of its potential listing on Coinbase, to $0.332. 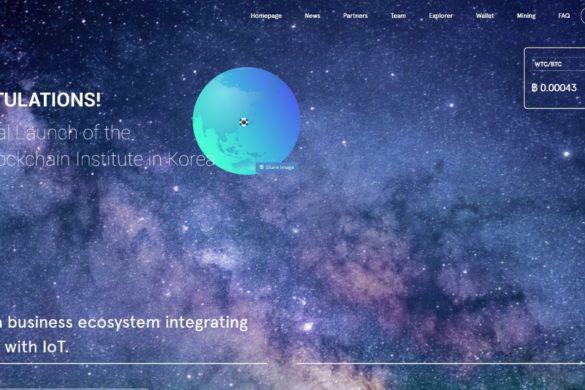 BAT operates on the Brave browser, a browser designed to deliver an open-in, privacy by design browser to the masses. Brave, the BAT platform, works on the idea of zero-knowledge proofs, which allows consumers’ data to remain on their device without it being passed onto either Brave or any other third-party provider. Brave simply verifies that the consumer performed an action – without disclosing the user’s identity. 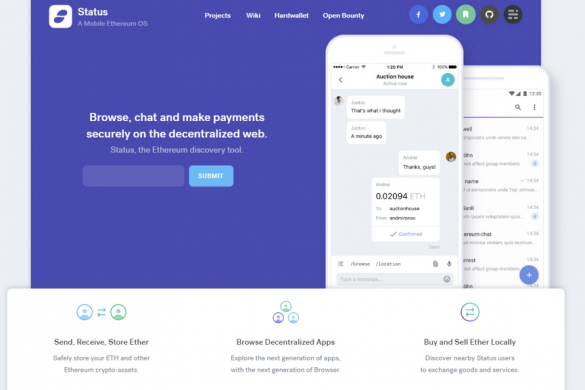 The Basic Attention Token (BAT) is currently restricted to the Brave browser, but the company intends to extend the BAT platform beyond Brave to other browsers (via extensions), chat/messaging applications, games and other attention economy apps. At the moment the Brave browser runs an automated and anonymous micro-donation system for publishers – Brave Payments. In the near future, the Brave Payments ledger will migrate these payments from Bitcoin micropayments to BAT microdonations. This will extend into advertising. Users will then choose whether they wish to see adds, which will involve a separate open-source component that privately matches ads to their interests and are anonymously confirmed. Displayed ads that users approve will be awarded through tokens to their publishers. These users will also receive BATs as well. As a utility token, they do not represent rights to future revenue shares. They are not intended to be a security or any other type of financial instrument. A total of 1 billion BAT was sold in the token sale. In addition, the team created a development team pool of 200 million tokens, and a user growth pool of 300 million BAT. The main exchange for purchasing BAT is on Binance, which currently has the largest exchange of the currency. BAT can be traded on Binance for BTC, ETH, and BNB. 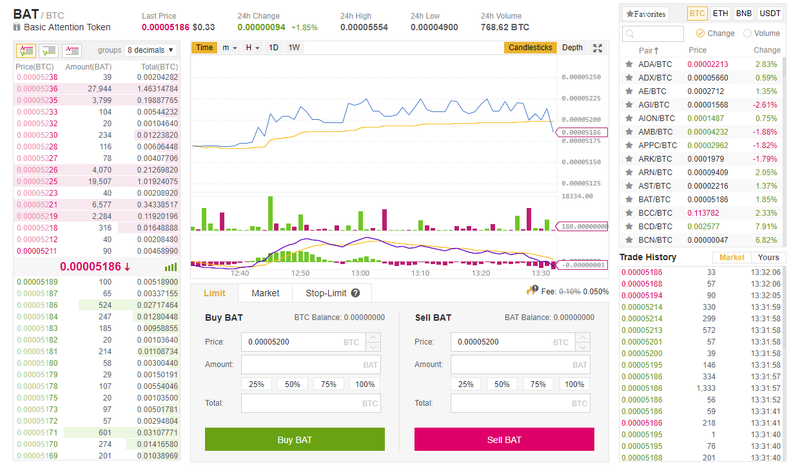 At the moment the current daily volume of BAT traded on Binance is just under $5 million. BAT can be stored in any wallet that supports ERC-20 tokens such as Coinomi, MetaMask and Myetherwallet. For maximum security, however, you should store your BAT on hardware wallets such as Ledger Nano S and Trezor. 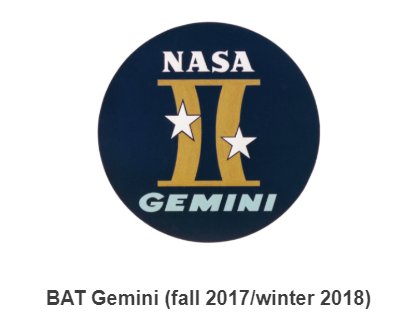 BAT’s timeline extends to the end of 2018. 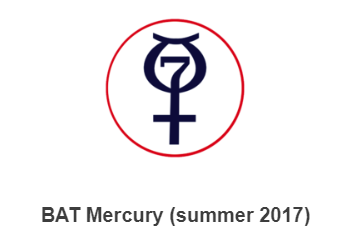 Its development has three phases, named after the US space missions of the 60s and 70s: Mercury, Gemini and Apollo. It has not yet released its plan for the Apollo phase. 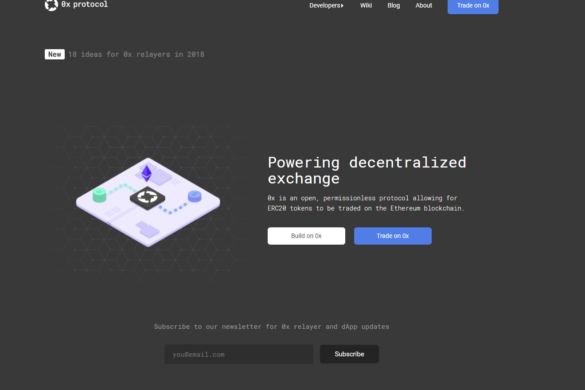 In 2017, it has successfully integrated the BAT wallet into Brave, converted Brave Payments from bitcoin to BAT, and started to develop user-private ad slot form factors. In addition, it has started to measure ad engagement and user satisfaction with the Basic Attention Metric (BAM) system. In 2018, it plans to bring BAT features to mobile platforms. It also plans to launch private ads that pay users. 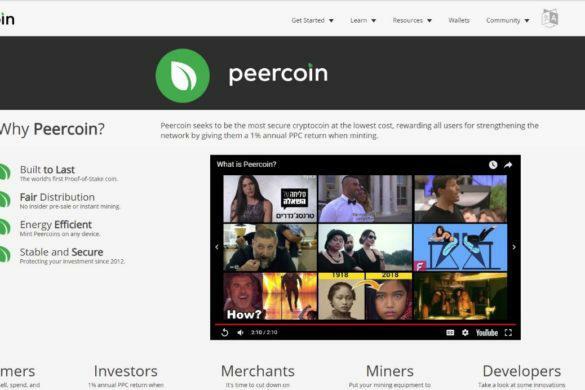 It has recently started launching user trial for opt-in ads that reward viewers, in addition to a special tab inside the browser which allows you to start a Tor session. In May, BAT announced the official opening of their London office. BAT has received the attention of Coinbase due to its impressive accomplishments. These include exceeding 3 million monthly users, making the top 10 list in the Google Play store in more than 20 countries, and being used by more than 18,000 verified publishers across 4,500 websites and 13.500 YouTube and Twitch stream accounts. It is one of several assets that Coinbase is considering adding to its exchange.